To say that I have been blown away at the hospitality South Africa has shown the rest of the world would be an understatement. I think back on recent Olympics and struggle to remember much reporting in the USA of athletes from other countries. I remember when a Togolese guy won a bronze medal in kayaking and NBC reported it and I thought to myself, “where are all the other fascinating stories like this one… like the Jamaican bobsledding team.” In today’s America, sadly, we have drifted so far towards being so US-centric that we only seem to root for the Americans. To me, Ubuntu is the acceptance of others as parts of the sum total of each of us. And that is exactly what I have experienced during the lead up to, and the initial days of this World Cup. There is nary a South African citizen that I’ve met on the street, or in shops or restaurants or hotels, that hasn’t gone out of their way to greet me and make me feel like I am home. And I don’t mean that in the trivial, “Oh, aren’t they nice, homey people here…” sort of way. I mean real, genuine interest and questions. People seriously want to know where I come from. What it’s like where I live. How does it compare to where I am now. What do I think of South Africa? 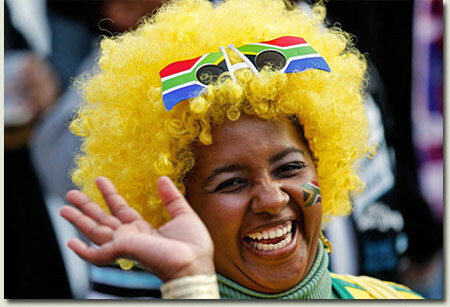 Oh yes, and what do I think of Bafana Bafana… The questions and conversations are in earnest. They are honest. And they are had with enthusiasm and a thirst to know more. South Africans are drinking deeply from the cup of humanity that has been brought to their doorstep. I would never imagine that an American World Cup or Olympics would ever be this welcoming to the rest of the world. And that saddens me for the state of my home country, but it also makes me feel the pride of the South African people. So, if South Africa accomplishes nothing more on the playing field, it will still have won as a host country. I am a cynic, no doubt about that. And yet I have to admit, I’m a little teary just writing this because I leave for home next weekend and I will be leaving a little piece of myself here in South Africa. I just hope I have learned enough to bring back a little piece of Ubuntu to my homeland, where perhaps with a little caring and a little water, it will take root as naturally as it does here, in the cradle of civilization. It’s funny, many people in America still ask me, “are the people in Africa very primitive?” Yes, I know, amazing someone could ask that but they do. And when they do, I usually explain that living in a mud hut does not make one primitive, however, allowing kids to sell drugs to other kids and engage in drive-by killings - isn’t that primitive behavior? I think it is. When I think of Ubuntu and my recent experiences here, I think America has much to learn from Africa in general, in terms of living as a larger village; and as human beings who are all interconnected with each other, each of us having an affect on our brothers and sisters.